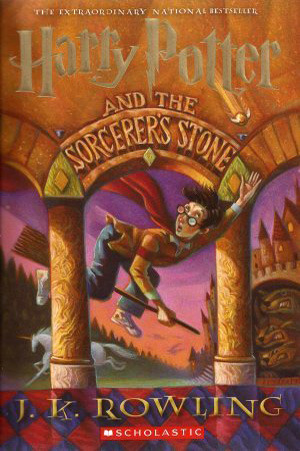 Book Review: Harry Potter and the Sorcerer's Stone by J.K. Rowling - Book.Blog.Bake. Every year in the Spring, I do an annual Harry Potter re-read. I’ve been doing this since high school at least, and every year my feelings on my favorite book in the series shift. I’ve been reading these books since I was in fourth grade, so each time I get more and more familiar with the story. My opinion of the first book in the series went up this reread. This is the introduction to Harry Potter, so it’s hard to review something that’s become such a cultural phenomenon that everyone knows about, even if they haven’t read the books, but I’ll do my best. The one thing that surprised me in this book was the pacing. I feel like in the books later in the series, the action is spread evenly throughout most of the pages and there’s several adventures. In this first book, the exciting part only comes in the last quarter. That’s not to say the first 3/4ths of this book isn’t entertaining–just that it’s less action/adventure than I remember. This is really the book in the series where Harry Potter is a boarding school book. So much of this book is about the introduction to Hogwarts and Harry doing things like adjusting to Hogwarts life, making friends, and sort-of adjusting to his new-found(to him, anyway) popularity. I think one of the reasons this book isn’t one of my favorites in the series is because of that emphasis. I’ve realized I’m really just not a boarding school novel fan. I love Hogwarts as a setting, but I feel this is the book that focuses most on the adjustment to boarding school life–as it should, since it’s important to Harry–but it just means it doesn’t captivate my attention quite as much as many of the other books in the series. One of my favorite things about how the Harry Potter books is how they are written to grow up as Harry grows up. This is most definitely a middle-grade book, but I don’t think anyone would call The Deathly Hallows a middle grade book. It does mean that in the past couple of years I’ve found the latter books hold my interest more, but as a start to a series that grows up with it’s protagonists, I can’t ask for more. Final Impression: This actually wasn’t my introduction to the Harry Potter series(I actually started by reading Harry Potter and the Goblet of Fire first), but it serves as a great series introduction. I loved watching the friendship between Harry, Ron, and the Hermione develop, which is something I feel I often take for granted in the latter books, and the introduction to Hogwarts. It’s not my favorite book in the series, but it’s a great beginning. 5/5 stars. Download Harry Potter and The Philosopher’s Stone E-book | Download Ebooks Here! I reread these often too, they are part of my collection of my comfort books. Do you know its called Harry and the Philosopher’s Stone in Europe? Always find it funny we have different titles for this one. Unlike you I’m a huge fan of boarding school novels, adore them. Totally agree this book and book 2 as well are aimed at the younger read, the storyline is less sophisticated. I think I can re-read this series because it’s just been such a habit since they were released, but there are definitely books I’ve done that with! One of my favorite books I read was out of print, so I spent YEARS tracking down a cheap used copy. When I found one, I realized I was so scared to re-read; what if it didn’t live up to my memory? Took me months, but I’m glad I finally did!